A unique treasure based on words used as the basic tactic of communication, a Language may perhaps be as essential as the other necessitates for life to sustain. It is a tool to communicate our thoughts, expressions, believes, opinions and ideas. During the early times, a language was only a mean of communication for daily basis. But humans’ needs increased with the passage of time. To pass on social, civil, political, traditional, cultural, religious and ideological thoughts most languages in the world got their unique form as written. There might be countless facts that we are yet unaware about the origin of language but the investigations throughout the history present different analysis related to spoken languages which date back to more than thousands of years in Mesopotamia, Babylon or other ancient places. However not all writings of pre-historic times could be preserved but fortuitously several could. Today, a number of historical languages that could survive might either had tremendously evolved, had been influenced by other languages or remained alive with a few minor modifications. Surveys and excavations carried out under difficult conditions in eastern and western. Balochistan in the twentieth century brought outstanding quality of prehistoric aesthetic concepts about Balochi language, which were previously unknown. Along with the results obtained by excavated materials, Syed Zahoor Shah Hashimi, one of literary giants of Balochistan, further researched and analyzed the ancient languages used in western Balochistan (now a part of Iran) and the Balochi spoken today in eastern Balochistan. Syed Zahoor Shah Hashmi identifies Baloch race among the semi-civilized and historic races that hadn’t got much attention from prominent scholars. He further relates the ancient alphabets found on excavated materials and in caves in Iran known as “Achaemenian Inscription” or Khat-e-Maikhi” (The inscription of nails). According to him, the earliest in history if Balochi language was written, that had been the time of Achaemenian Empire in Persia before 5th centaury B.C (550-330 B.C). 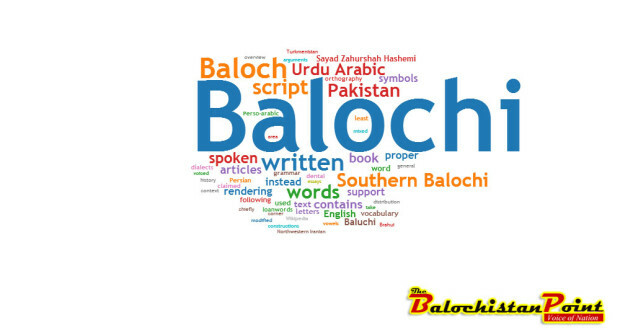 Some researchers argue that the Balochs are distant populace of Arabs, likewise Balochi as a language had been thought to be derived from Persian. But then a few researchers believe that neither Balochs were Arabs nor had their language ever been same as Persian. There might not be any language in the world that had not evolved over time; same is the case with Balochi. Time and situations has influenced it, the way it looks like and is spoken today. Akamanshi, a popular rular of Zartusht period who is known as one of the most famous rulers of that time had one of the greatest empires in the Persia. Syed Zahoor Shah related these lines with ancient Balochi and said that these too sound more like Balochi than the ancient form of Persian. Regardless of many researches and different hypothesis about Balochi language, it is still uncertain whether Balochi was really a language used in the ancient Persia? Through the prehistoric writings of Balochi language, it is verified that Balochi probably had some minor changes with the course of time but didn’t utterly evolve. It was written with the use of “Achaemenian Inscription” in the prehistoric times, but later with the use of the Arabic inscriptions. Fifteenth Century A.D, is known as the classical age of Balochi language, when extensive poetry defined Rind Tribes, and particularly the great Baloch ruler “Meer Chaker Rind” who ruled the race for about seventy years. Extraordinary facts about Balochi Language can also be all that poetry related to each historical war, anecdote or any incident that occurred after or even years before “The Rind Period” (1450-1650 AD) and were remembered and passed on to forth coming generations through poems. Sharing similar beliefs may unify different nations somehow but language and culture are two distinctive vitalities that are far more influential. Regardless of being a language that still needs a lot literary and linguistic works, Balochi is yet the base of unity amongst the Baloch race.